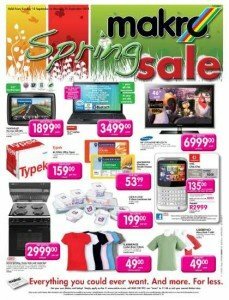 Makro store catalogue promotions offer some good deals on a wide range of products. Makro opened its doors in 1971 in Germiston in the south of Johannesburg. This was the first cash and carry store in the market and was also the first to use IBM technology to track the sales and stock in the store. Over the years, Makro opened more and more stores in towns such Pretoria West, Woodmead, Port Elizabeth, and Strubens Valley. Initially, Makro was like other retailers where you could just walk in and purchase. However, in 2001, they introduced the Makro store card and made it policy that you could not purchase anything in the store without the store card. This may seem like an extreme step to take, but this has lead to them have one of the largest customer databases in South Africa and has additionally allowed them to monitor which people are buying what products. This means that they truly understand what their specific customers want and can recommend deals and products to these customers. Makro now has 14 stores that they refer to as warehouse clubs. The reason they do so is that they purchase in bulk which allows them to offer lower prices than you would find in normal retailers. They trade in food, general merchandise, and liquor. This wide product offering and their low prices have resulted in over 1.8 million people visiting Makro stores in 2010 and this number is increasing yearly. One of the main reasons for this is that Makro believe in providing their customers will promotions and deals which they cannot resist and through the information that they capture when their customers use their Makro cards to purchase products, they can update these customers weekly on the specials which they think will be relevant to them. Makro have also realised that people do not want giant catalogues that they have to sift through to find the products that they want. As a result, the Makro store catalogue promotions have been divided in to a number of catalogues to make it easier for these consumers to find exactly what they want. Currently they have four catalogues on offer. With the Rugby World Cup 2011 having started on 8 September, Makro has realised that there is an increased demand for all things rugby. From supporter’s shirts, to rugby balls, you can find all of your sporting requirements in this catalogue. This catalogue additionally includes specials on things such as treadmills, and bicycles, just in case the running around on the field has influenced you to start exercising yourself. If you are an avid supporter of the Samsung brand and are looking for great deals on some of their leading appliances, then this is the catalogue for you. This catalogue includes everything from fridges to cellular telephones. For those of you who are just looking for something new for the house, or are looking for that perfect outside table set to set you on your way to all the braais that you will be having in Summer, then why not take a look at this catalogue. There really is something for everyone on sale at Makro this Spring. The most important thing about these catalogues is that the deals are only valid for a short period of time as they have so many great deals to offer you each week, they have to update them regularly.